Chicken is a ubiquitous ingredient in our house, so this will be the first of many chicken entries on the blog. The original recipe is from the Barefoot Contessa’s newest cookbook and calls for fresh thyme. However, I did not have any on hand and really did not want to make a special trip to the store and spend $3 on a tiny package either. I do have a potted rosemary plant on the front porch so that is what I used. Besides, lemon and rosemary are one of those magical culinary combinations. The pan sauce is tangy and garlicky and would be perfect spooned over mashed potatoes. 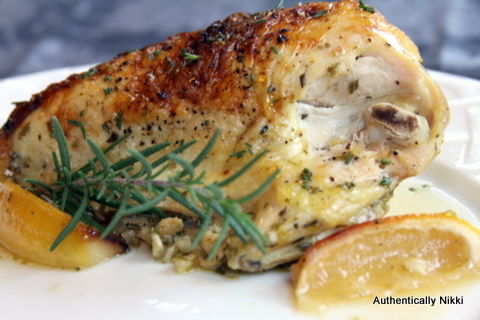 The sliced lemon that is cooked with the chicken will lend a slightly bitter flavor to the sauce. It looks really pretty, but if bitter is not your thing then leave it out. Next time I make this it will be without the sliced lemon. When we warmed up the leftovers the next day, the bitterness was much more pronounced and not very pleasant. Warm the olive oil in a small saucepan over medium-low heat, add the garlic and cook for 1-2 minutes until fragrant but not brown. Off the heat, add the white wine, lemon zest, lemon juice, oregano, rosemary and salt. Pour into the bottom of a 9-x13-inch baking pan. Trim any excess fat from the chicken breasts. Pat dry and place them in the pan skin side up on top of the sauce. Brush the skin with additional olive oil and sprinkle with salt and pepper. If using, cut the lemon into 8 wedges and tuck in amongst the chicken. Bake for 40-50 minutes or until an instant read thermometer registers 165 degrees near the bone. Serve hot with the pan sauce spooned on top of the chicken. This entry was posted in Poultry and tagged chicken by authenticallynikki. Bookmark the permalink. Only 9 garlic cloves? Wow! And how much wine goes into the cook?